Projects are performed in an organization and the functioning of the organization might affect the project. 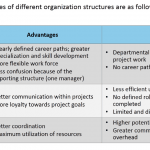 The different organization structure types explained here are based on the level of authority that a project manager gets into those organizations. 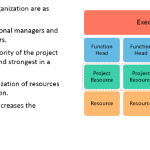 The next type of organization is projectized organization. In such organizations, there are no departments. 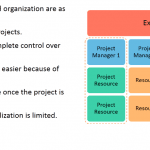 The organization’s resources mostly work on projects. Team members report to a project manager. The project manager has complete control over the resources. When the project is completed, either they move on to another project, or they look for some job outside the company. They do not have a department for themselves. 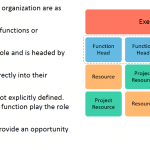 The third type of organization is a matrix organization, which is a blend of functional and projectized organizational structure. A team member belongs to a department as well as they are part of a project team. In such organization, team members have two bosses, one, their department head and the second, their project manager. Since there are two bosses here, this type of organization is further classified into three different types. They are weak, strong, and balanced matrix organization. 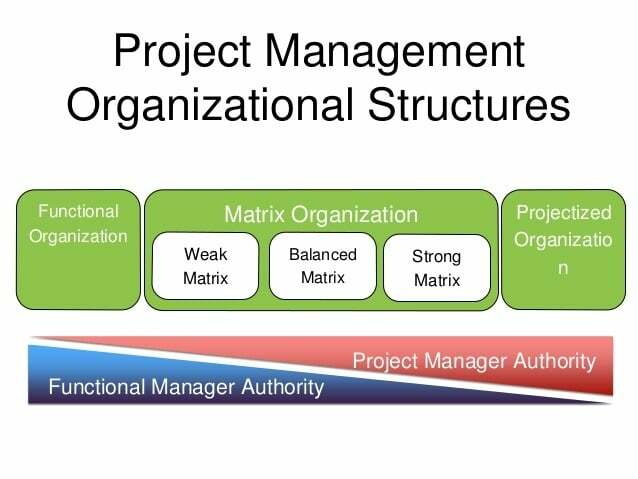 So out of the two bosses that team members have in matrix organization, if the project manager has more authority over the team member, such organizations are called strong matrix; where the functional manager has more authority, it’s a weak matrix organization. If they both share equal authority, than it’s a balanced organization. There is another term that you might find in the exam, called “tight matrix”. This generally refers to a “co-located” team, i.e., a team that has been placed in the same location to enhance their performance.